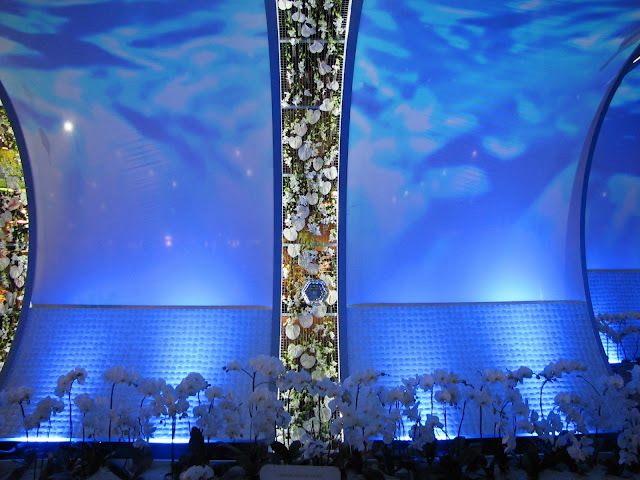 I had the pleasure of attending the 2012 Philadelphia International Flower Show. I was traveling through “Islands of Aloha”, as the Pennsylvania Convention Center was transformed into a Hawaiian paradise. Although I am a native Philadelphian, I must admit this was my first show. Thousands of locals and tourist grace our city to attend this show each year and it is quite an extravaganza, so this year I took advantage of a day off and went to check out the hoopla with my daughter. We entered the exhibition through a giant wave of orchids and a towering 25-foot waterfall. There were incredible motion graphics that transformed the show floor with lava flows and crashing waves; it appeared as if were under the sea swimming with the dolphins. We had the opportunity to participate in a traditional Hawaiian luau, featuring hula dancing and music. The beauty of the displays left us in awe of the craftsmanship of the designers, not to mention the fragrances that embraced the room. So why did we feel like we were at Walmart on Black Friday? We came through the door and the “wave of orchids” quickly turned into a sea of fanny packs. One by one, they barreled past us wearing jeans, t-shirts, sweat shirts, sweat pants and oh yes, sneakers. Hey, we all like to comfortable, I’ll be the first to admit I enjoy my lounge wear…..when I’m LOUNGING. The attire was one thing, while the behavior was nothing short of uncivilized. Were we now part of another display? Perhaps it was the interactive “Savages Deep Within The Jungle” display or was it tragically just etiquette gone wild? Emily Post is surely spinning in her grave! The visitors at the Flower Show knew very well that they would be attending the show, they paid an admission fee to barrel through that door. They were not morphed from their beds to the Flower Show that morning, so why were there pajama bottoms strolling around as if they somehow belonged? These people made a conscious decision to slay every ounce of etiquette before they left the house. It was a crime I tell you, a down right pre-meditated murder of fashion. This was a job for ……. The Fashion Police. You have the right to remained dressed. Anything you buy or wear will be held against you. You have the right to a stylist, if you cannot afford a stylist, one will be appointed. The men and women of the Philadelphia Horticultural Society worked effortlessly preparing to host this event. Their efforts shined through as we walked around admiring their ability to highlight the Hawaiian culture through flowers and landscapes. We were able to capture the true essence of the Islands and their beauty….it was nothing short breathtaking! But lets just think for a moment if they hadn’t… What if they had the same lazy attitude as some of their visitors? What if they attached as much effort in their displays as some of these visitors put into their attire? I’m going out on a limb here…but a can of Hawaiian punch, placed on a rock, probably wouldn’t go over very well. I can only imagine the outrage…I didn’t pay to see this crap…I want my money back. Suddenly this crowd of lazy dressers are energized, outraged and demanding what’s right and just. Oh, my! It’s not just the Flower Show, not at all. We just don’t dress up anymore for special occasions. Weddings, funerals, graduations, an evening on the town, hey, even churches aren’t spared from this lack of fashion consciousness. Since when did dispensing Communion to a young woman in short shorts with a thong exposed become acceptable. In my day, which wasn’t that long ago, this Jezebel would have been tackled on her way to the altar by a group of nuns! No jacket at a wedding, jeans at a funeral, sweat pants at graduation and we won’t travel down the ugly road of “a night on the town,” this lack of self-respect is running rampant in our country. I’ve watched the decline of etiquette slowly slip away over the years along with social skills, manners and dress protocol, but what I didn’t do was associate this complete disregard for one’s own appearance or lack of respect for our hosts as something deeper….a promotion of self-destruction. Manners reflect personality, they are an outward reflection of our individual character and attitude toward life. Let’s start using our manners daily, hand them down to our children and regain the respect for ourselves that we so quickly demand from others. Good stuff. I can picture it. Hope folks weren’t sampling the flowers too. I experienced a similar phenomenon the first time (and only time) I visited a casino – people took leisure wear to the extreme and smoked like crazy. It was shocking.